NEW ORLEANS, La. (Feb. 10, 2017)  New Orleans is once again hosting more than 30 colorful Mardi Gras parades during the 2017 Carnival season leading up to Fat Tuesday on February 28, 2017. 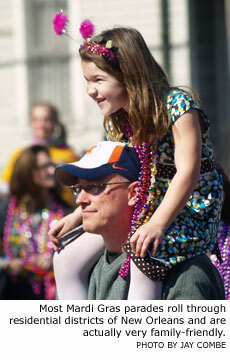 Contrary to what is often portrayed in media coverage of Mardi Gras, the parades are actually very family-friendly. Bourbon Street lives up to the more wild reputation, but the parades roll down wider streets in residential districts and nearby communities, and police officers work hard to ensure that the crowd stays festive but not crazy. Each parade carries the name of a different "Krewe" which sponsors its own parade. The following schedule lists parades within New Orleans for the two primary weekends of Carnival. Additional parades are held in the region, including a dozen parades in the nearby community of Metairie. Parade times are approximate, especially when one parade follows directly behind another. And since parades travel for several miles, depending on your viewing location the parade could arrive much later than the start time shown. 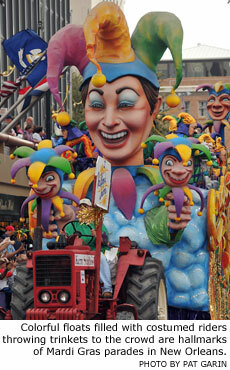 Visit the website of each Krewe for more details including parade route maps and parade themes. 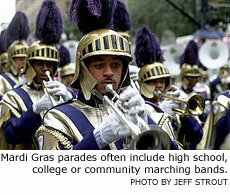 Photos courtesy of New Orleans Convention and Visitors Bureau.